This dish is so simple, and yet completely satisfying and delicious. It features regularly on our table during the summer months and has also become our daughter, Orlaith’s, favourite dish alongside Moussaka. Wine Suggestion: A lovely and fresh wine but with depth and reasonable body works well with tis; something like a very good Verdicchio – try Sartarelli’s Talivio or Umani Ronchi’s Casal di Sera. If you feel like a red try a Cabernet Franc from the Loire, like the thoughtful and expressive Chinon’s by Charles Joguet. Heat the oil in a large saucepan, add the garlic and courgettes, and a pinch of salt.Cook gently to soften without browning. 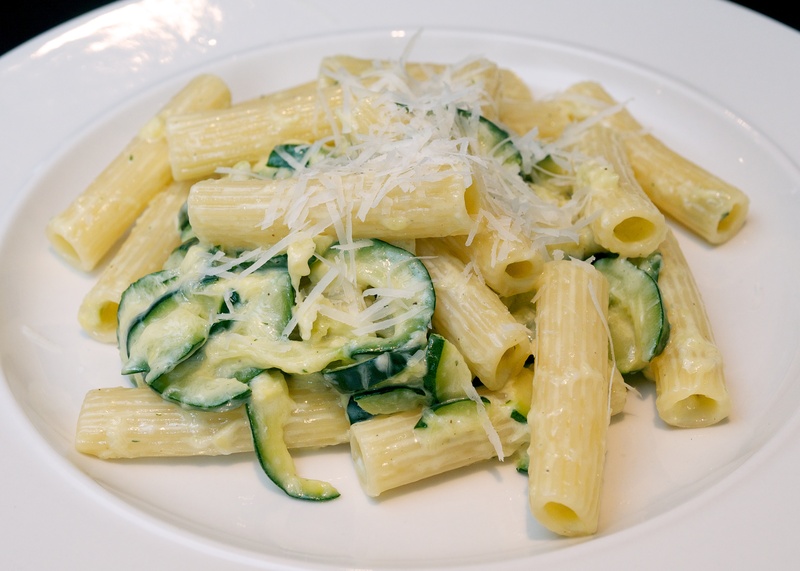 Continue to cook until the courgettes are completely soft and almost all of their water has evaporated (20-30 minutes). Then bash the courgette mixture to a rough purée with a wooden spoon or masher. Stir in the cream and Parmesan and allow to bubble for a minute or so until the cream has reduced a bit. Meanwhile, cook the pasta in salted water until al dente. This does look very good, simple and easy, plus a neighbour of mine is giving away courgettes from his garden!